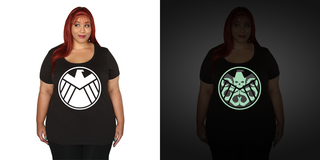 Want to show off your allegiance to the nefarious forces lurking within Marvel's defense agency SHIELD? This glow-in-the-dark shirt will reveal your true colors when the lights go out. Her Universe just unveiled their line of Marvel merchandise, including a sweet Captain America cardigan and Avengers-themed leggings. But we're real suckers for this clever SHIELD/Hydra number, which is available as a tank top or in plus sizes as a t-shirt.